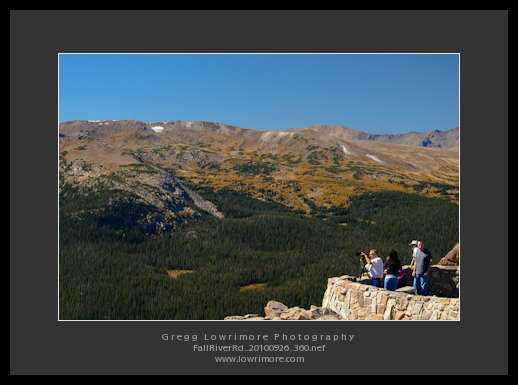 On a last minute whim, I decided to drive up to Rocky Mountain National Park (RMNP) on Sunday to see what the Aspens were like on Fall River Road. 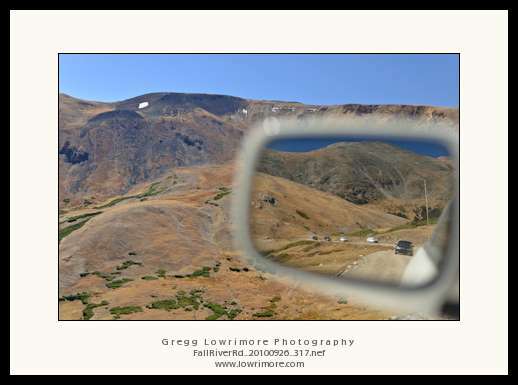 The drive in to RMNP was a little slow due to the Aspen Gold Festival happening in the town of Estes Park just outside RMNP, so traffic played a roll both going in and later coming out of the park. I arrived at the gate about 10am and was thankful to only be third in line waiting to get in to the park (which was nothing compared to when I drove out around 2:30pm where I saw a lineup of cars stretching for a half mile back from the entrance, all waiting to get in!). For what everyone has been claiming would be an early fall, I was quite surprised to see a lot of green aspen groves along the drive in to Fall River Road. 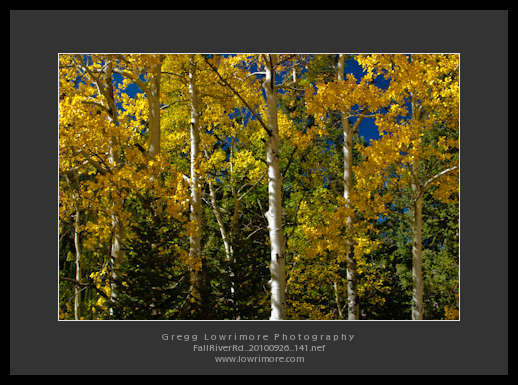 And I began to worry… Luckily, about half way up the hillside I starting seeing small groves of Aspens that had turned to gold. Ah, I love this time of the year! 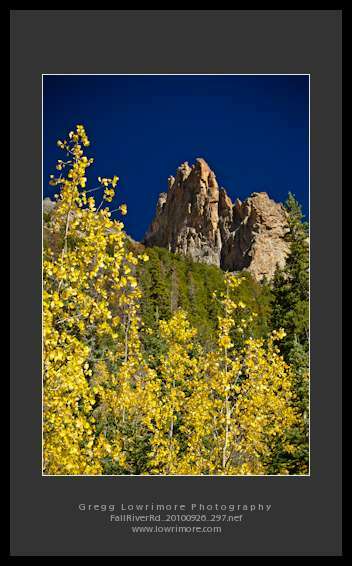 There’s something about the Aspen gold, cool crisp days and that Colorado Blue sky….. 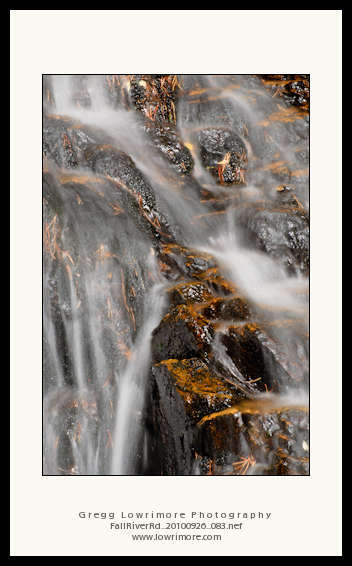 So I decided to play with waterfalls if I could find any, and started photographing at the Fall River, which parallels the road for a good portion of the drive up the canyon, and which at this time of the year is more like a creek rather than a river. 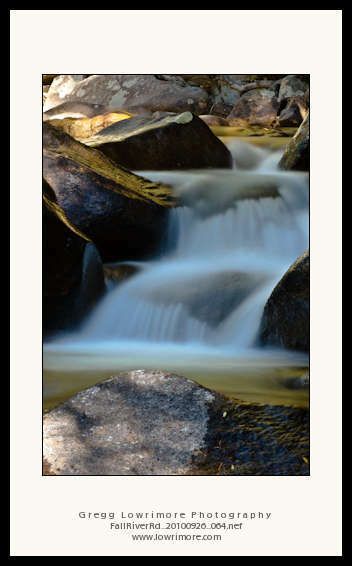 Nothing fantastic, but fun nevertheless… 2-stop ND filter AND a circular polarizer filter helped to smooth out the “rushing” water. 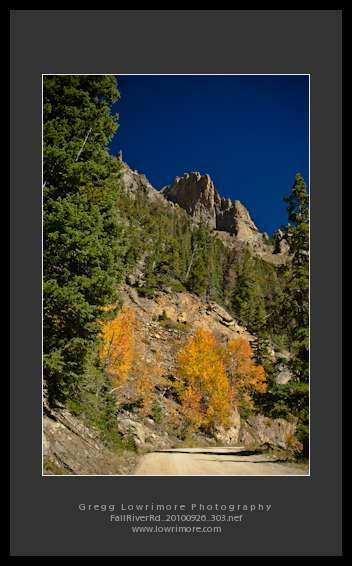 And then further up the canyon, I came across a nice little grove of Aspens and was able to grab these two compositions in between the dust clouds from the almost constant stream of passing cars. Here’s a better view of the spires near the summit of Mt. Chapin. I had posted an iPhone photo to my Facebook stream using the Motion-X GPS iPhone application to track my route, but it pales in comparison to these shots! And here you can see the train of cars that was always present on this drive…. Grrrr. 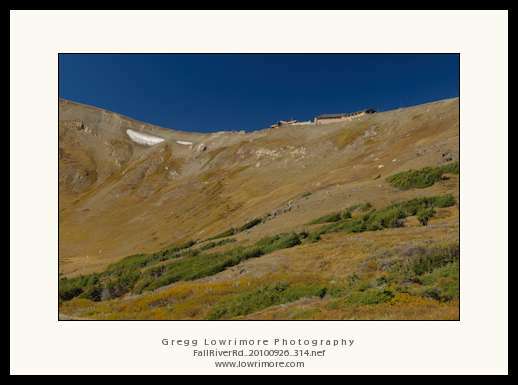 This train was pretty close to the summit area too. 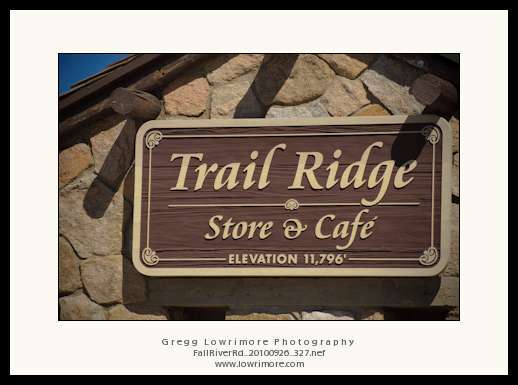 You can see the Trail Ridge Store & Cafe on the ridgeline below. I was parched from all the dust! As you can see, not the greatest light to be out photographing, nothing dramatic about midday sun, but crystal clear Colorado Blue skies aren’t too bad either. 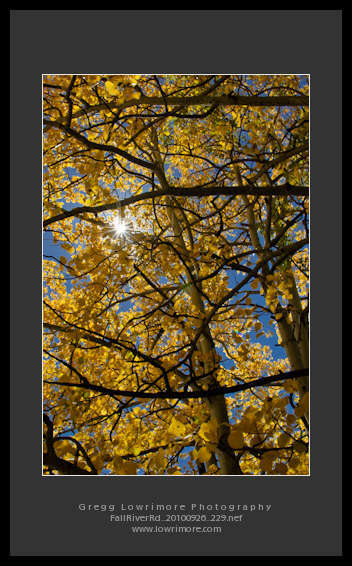 And Aspens love to be photographed with backlight at almost any time of the day. 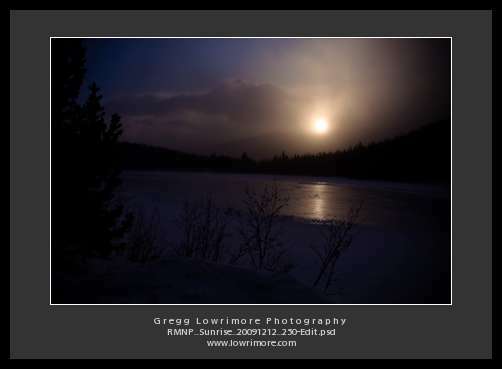 Hope you enjoyed this little trip up the Fall River Road. Where did you go out to shoot the Aspens this year? 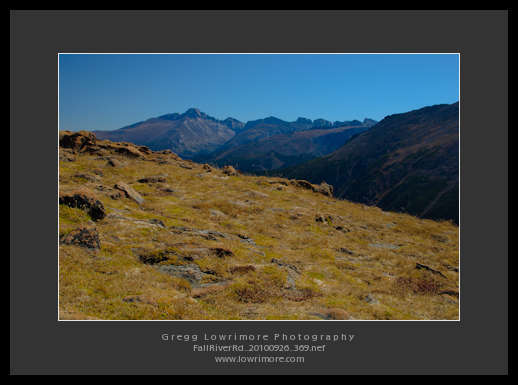 Posted in Landscapes and tagged Aspen, autumn, Fall River Road, gold, RMNP, Rocky Mountain National Park, silky, water by greggl with 1 comment. Anyway, here are a couple images from that morning’s adventures. 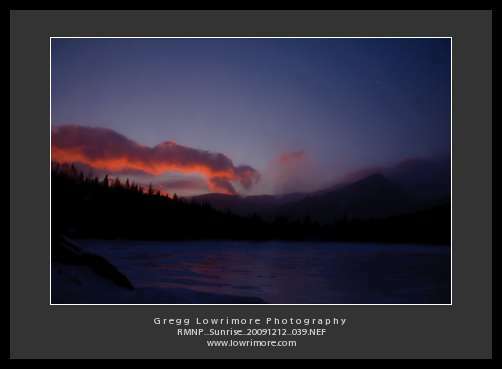 Posted in Landscapes and tagged Bear Lake, clouds, frozen lake, RMNP, Rocky Mountain National Park, snow, sunrise by greggl with no comments yet. During a recent trip into Rocky Mountain National Park, my friend Steve and I came across a large herd of Elk just grazing down near the Fall River Road entrance. These two young bulls started sparring on the one end of the hred while this older bull was kind of refereeing the whole event and keeping an eye on us taking pictures of them. 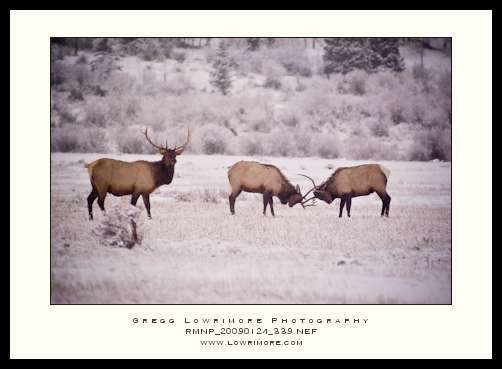 Posted in General and tagged Bull Elk, RMNP, snow, sparring, winter by greggl with no comments yet.